Amber’s family adopted Autumn last year. 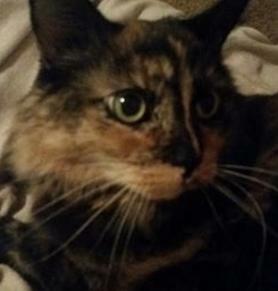 Here’s what Amber has to say: “We are so happy to have adopted from the shelter! Autumn was renamed Hazel, and has taken to life with us very well. She’s still a little apprehensive of her human children house mates (Parker who is 4 and Gwen who is 1) , but is very patient with them and seems to enjoy looking down on them from anywhere out of reach haha. She is definitely a cuddler and has been a great addition to my evenings where she and I sit and hang out together while I do homework. All in all, we are thrilled and thankful that we are able to be Hazel’s forever home!